After visiting Gwongeumseong, we went back to the cable car station to take the cable car back down to the main visitor area of Seoraksan National Park. 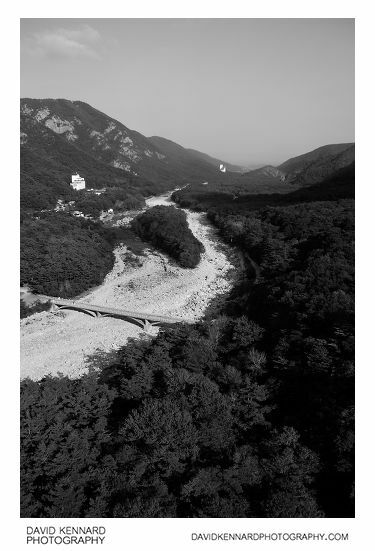 Looking east out of the cable car window, you can see the dry rocky riverbed running towards the sea at Sokcho. For these photos taken through windows I prefer to use black and white with a hefty curves adjustment to boost the contrast. Above is another one from the cable car, coming down towards the river. The bottom cable car station is on the other side of the river. When we got to the bottom cable car station we had some Bibimbap for a late lunch in the restaurant there. It was bibimbap with an egg in it, quite nice and a good sized portion. 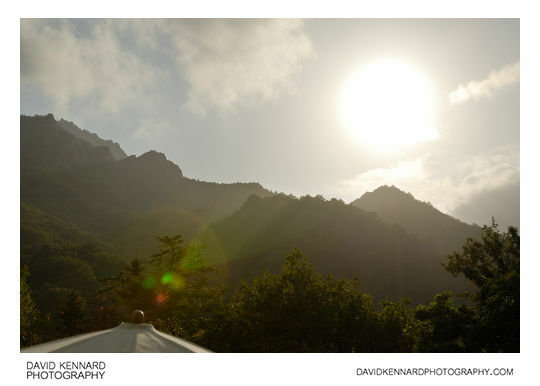 I'm not sure why I took the above photo, since it has a cut off top of an umbrella in the foreground and a large amount of lens flare. Still, I kind of like of the soft warm feel to it. There are a few shops in the main visitors area of Seorksan National Park. This one sells a variety of trinkets, and the left half of the building is a restaurant I think. I bought hardly any souvenirs on my holiday because I was only travelling with one bag (and the tripod bag), so didn't have any room for anything extra. 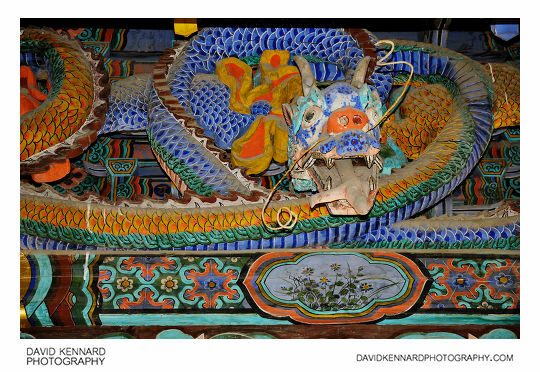 Above is a dragon carving in the top section of the Seoraksan-Shinheungsa (Hangeul: 설악산신흥사; Hanja: 雪嶽山新興寺) gate. When trying to research a description for the above photo, I found lots of photos of the other side of this gate, where it has written the hanja for 'Seoraksan-Shinheungsa', but I couldn't find any photos at all of the side with the dragon carving on. You might be able to tell I used flash for the above photo (the dragon's whiskers are casting harsh shadows on his body). 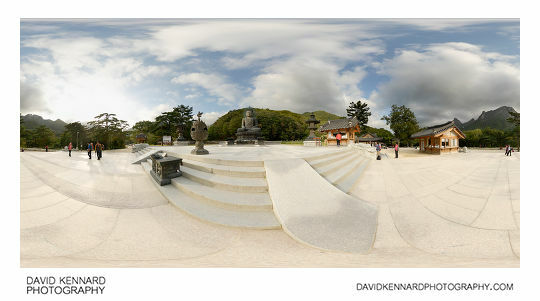 After looking at the gate we went back to see the Great Unification Buddha, and I took a panorama here. I think that probably it would have been a much better photo if I'd got nearer to the statue though. When processing this photo, I had to clone out a drink of coke I'd left on the steps. I think at the time I took the panorama I thought it would add some interest and location context to have a Korean Coca Cola cup in the image. But actually it just looked like someone had left some rubbish on the steps, so I decided to clone it out. 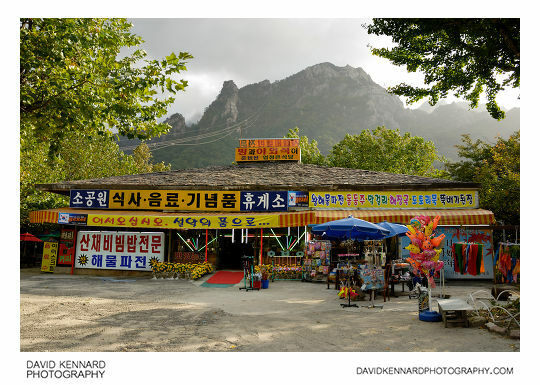 In this photo you can also see some walkers to the left, and someone buying a candle at the small shop on the right. They would then place the candle in one of the cabinets in front of the statue. More on the Unification Buddha statue in my next post. hey, I would like to visit this awesome seoraksan… Would visiting the mountain in May be a good idea? My understanding is that June and July are very rainy. 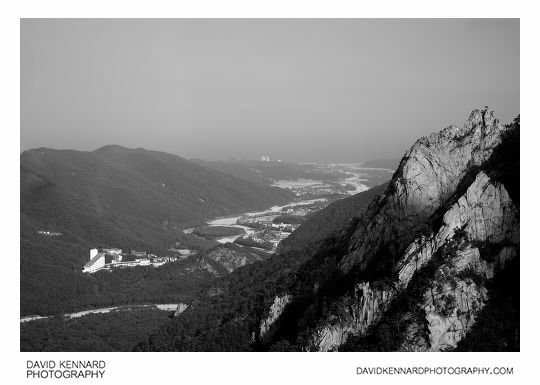 Because of the high altitude, the peaks of Seoraksan have snow quite far into the year. I would expect by May though, most or all of the snow would be melted and Spring would be underway. So the weather should be quite pleasant, and the slopes probably covered in green trees (similar to what it was like when I was there in October). Nice, thanks! And keep the photos coming! Its awesome! One more question…. I’m curious. Does your cellphone work in Korea? I didn’t take my phone to Korea, but I don’t think it would have worked anyway. You should be able to use VOIP / Skype though.